In recent years, Doombringer has been responsible for some of the most unholy emanations from the bleak region of Poland. After several magnificent demos and 7” releases, Doombringer now unleashes its debut full-length, “The Grand Sabbath.” This album is a triumphant exaltation of darkness. The band, which features members of Bestial Raids and Cultes des Ghoules, has spent considerable time arriving at this point, and their dedication is manifest. Doombringer imbue the cacophonous intensity of Death Metal with the unconstrained evil of Black Metal, exploring the nexus between the raw, oppressive darkness of Goatlord and the ecstatic and transcendent evil of bands like Varathron and Mortuary Drape. The high level of composition is immediately apparent, and against the backdrop of the band’s tremendous songwriting is a tendency to enhance their sound with unanticipated sonic and vocal flourishes that accentuate the unique character of the songs. The use of varied vocal styles in particular is immediately arresting and provides a welcome departure from the usual monotonous vocal delivery of most other bands. To bring the album together as a whole, Doombringer sought Marko Marov to provide his uniquely demonic vision for the artwork. 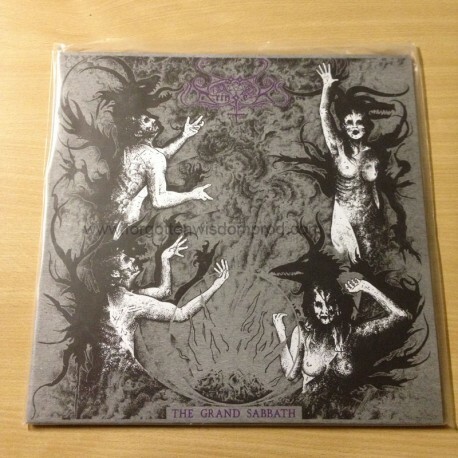 Regarded as a whole, “The Grand Sabbath” is a manifesto of the future direction of Black/Death and is destined to expand and epitomize the perimeters of extremity inherent in both genres.